Wearers of luxury fashion brand Vetements latest collection can learn about the history of Georgia by scanning QR codes incorporated into the items. The SS19 collection is inspired by Vetements founder Demna Gvasalia's experience of growing up in war-torn Georgia. It features pieces that can be scanned to reveal information on events that that took place in the country in 1992, which the Sukhumi-born designer experienced first-hand. 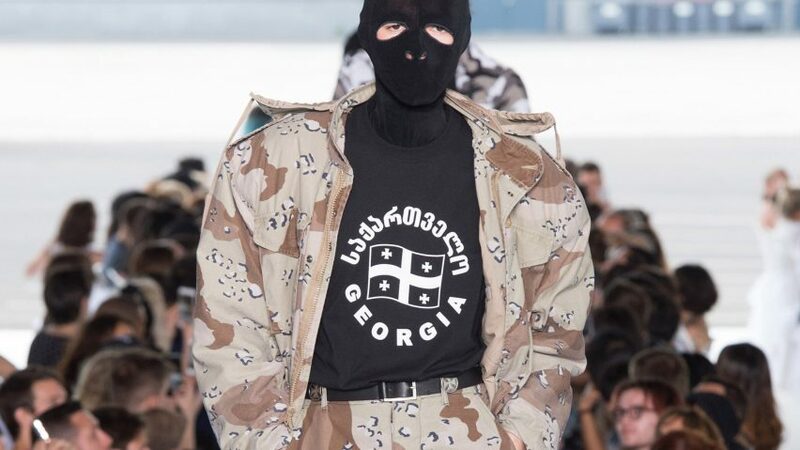 Each item in the SS19 collection includes a QR code that when scanned will send users to the Wikipedia page titled "Ethnic Cleansing of Georgians in Abkhazia". "I feel everybody today talks about war, refugees. And I am like, yes, I know exactly what that means. It's weird. This is about my life, but also it's about everything you see on CNN, as well," said the designer. Presented 1 July 2018 on a catwalk under a flyover in central Paris, the SS19 collection is inspired by "family and violence" and includes garments with Georgian and Russian slogans. One of the pieces is printed with the words, "see this clenched fist?" and underneath, the Georgian word for "enough". Elsewhere, the Georgian phrase for "God Forgive Us", and an offensive Russian swear word appear – all of which are translated into English online. "It was like dressing a documentary of my life," said Gvasalia. "I dedicated this collection to Georgia, the Georgia where my brother Guram and I grew up together in the 1990s, and the war that happened where we lived." "I tried to face this angst and fear and pain in this show. I didn't want to remember before, I didn't want to go that far," he explained. Gvasalia cast 40 models from Georgia to walk in the show. "I use them as a voice for a youth that doesn't have one, and is represented by a political regime in that they can't demonstrate or say what they think – there is no real freedom in Georgia," he said. "I lived through that and realised it was a very painful time for me, and I needed to put it out there." The collection follows an ongoing period of socio-political unrest in Georgia's capital Tbilisi, where the government raided and closed the city's techno clubs Bassiani and Cafe Gallery, which led to mass protests in May this year. The designer is no stranger to controversy. Last year, Balenciaga – also fronted by Gvasalia – released a large blue tote bag that bore a striking resemblance to IKEA's iconic Frakta bag, which was priced at £1,705, while in May, the brand caused a stir with a T-shirt that features a long-sleeved shirt attached to its front.